If you play sports, you should keep two things in mind related to your vision: protection and vision performance. Sports lenses protect the wearer’s eyes. Sports such as tennis, baseball, softball and racquetball may have ball speeds of 90 mph or more. In baseball alone, there are over 500,000 injuries per year! Most eye injuries occur in basketball where an elbow or a finger jabbed into the eye can cause corneal abrasions, fractured bones, retinal detachments or even blindness. Polycarbonate lenses are more resistant to impact than glass or plastic and offer protection for 90% of eye injuries. Protective eyewear fits well, features a padded bridge, has prescription or non-prescription lenses, and has a deep-grooved eye wire to prevent the lenses from falling out. Insist on quality when buying sports eye protection – it is worth it. Specialized lenses can also optimize your vision. Depending on your sport, certain lenses are more appropriate than others. 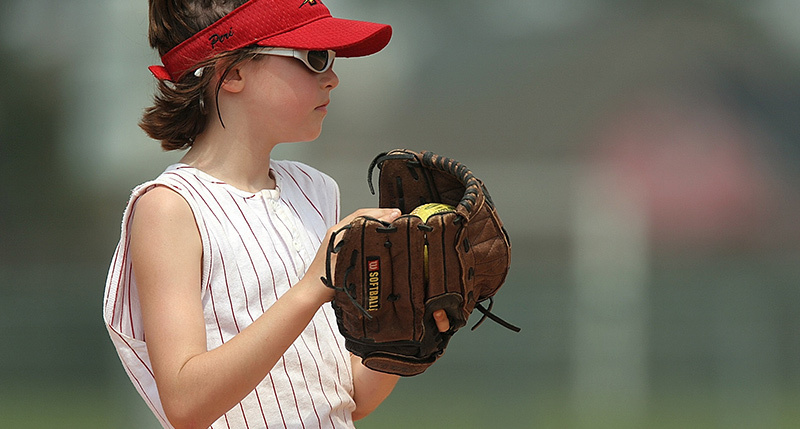 Dark, UV protection lenses are great for baseball and other outdoor sports. Golfers can benefit from gray-brown colored lenses which make it easier to outline the course. Even if you do not normally wear glasses, non-prescription sports lenses can benefit your performance. Some people think that lenses prevent the wearer from seeing the action but many sports lenses have anti-fog, glare reduction, and scratch resistant properties. Some are also designed to maximize peripheral vision. To reduce exposure to UV rays and their effects, it is recommended that you invest in a set of sunglasses which can provide at least 98% protection from UVA and UVB rays. While cheaper sunglasses can range from poor to excellent UV protection, sunwear lines found in private eye care offices provide the best protection from the sun and you have the assurance, expertise, and backing of the staff making recommendations. Polarized lenses block light reflected from surfaces such as a flat road or smooth water. If you are involved in activities such as water sports, skiing, biking, fishing, and even driving, polarized lenses can be very helpful in reducing glare and giving a clearer view. In one third of all traffic accidents, glare is listed as a contributing factor. Finally, if you have a youngster in the family, it is never too early to fit them with sunglasses. Children under the age of 20 are the most susceptible to the damaging effects of UV light. UV damage is cumulative and exposure at a young age will lead to issue later in life.